More than 80%* of UK retailers are missing out on sales and paying needless costs because they don’t gather one of the most basic types of sales information: customer traffic. At a critical time for the market, this paper reveals what’s at stake for stores across the UK and what they can do about it. It’s no secret that many retailers are fighting for survival. The margin between labour costs and sales revenue has been shrinking for some time. And with the global recession sales have plummeted, adding dramatic urgency to every strategic move retailers make. 1. The proportion of customers that buy. 2. The true impact of any sales or marketing campaign. 3. The most cost-effective way to deploy staff. And yet, current evidence suggests UK retailers seriously underestimate the value of customer traffic data. Research by Irisys indicates that only 13% of national retail stores are actually equipped with and using customer counting systems, and the adoption rate for regional or local stores is even lower. Usage varies greatly across different retail types and locations, with higher use for example in shopping centres. But from any perspective, the level of adoption is remarkably low. If it’s so essential, then why doesn't every retailer count traffic? A short answer is that, in an industry driven by sales figures, it’s easy to become blinkered to the value of activities that don't primarily record sales. But to understand the extent of what retailers are missing, why it happens and how to respond, we need to look at the three key benefits of people counting in more detail. The sales conversion rate for any store is simply total sales divided by total traffic, normally expressed as a percentage. Generally, low-margin businesses such as convenience or discount stores convert more customer visits to sales. A grocer’s conversion rate may be more than 90%; a specialty clothing store less than 10%. Each category has specific needs for accurate measurement, which may include adjustments for data ‘noise’ created by staff or other non-customer traffic. You cannot calculate sales conversion without a traffic counting system. On our earlier evidence this means that more than 80% of UK retailers do not know their sales conversion rates and cannot quantify the number of customers that don’t make a purchase. • There are significant opportunities to convert more sales within every retail category. • Most retailers have highly sophisticated data on their buying customers, but almost no information on non-buyers. • Non-buyers often go on to purchase from competitors and may be permanently lost as customers. At 10:33 AM, a customer walked out because there was not a sales associate in the department to retrieve a pair of shoes that she wanted to try on. At 11:56 AM, a customer left because she could not find her size in the messy, crowded rack. At 12.42 PM, one of the store’s most loyal customers put down the items she was holding and walked out because the line was too long at the register. At 1:40 PM, a customer does a return instead of an exchange of merchandise because no one asked the simple question. At 3:29 PM, a customer, ad circular in hand, exited the store, frustrated that he could not find the item in the ad that he wanted to buy. Deloitte’s study acknowledges that being reluctant to focus on missed sales is partly a symptom of retail’s sales-driven business culture. But there’s also a stark conclusion: “Analysing success will not recover the opportunities that were lost”. So it’s a tough message at a time when retailers are feeling vulnerable: success lies in measuring failure. To make more sales, you must first know about the ones you’ve missed. Approximately 40% of people in the UK are employed in marketing activities of some sort, and in a media-saturated age squeezed by recession, retailers are constantly being sold new ways to market their products. Faced with such pressure to take action, many retailers readily launch into costly sales campaigns, without a clear understanding or properly defined objectives. Common misconceptions include the belief that you can’t practically measure advertising, or that sales are the only measure. Too often, if sales exceed expectations, retailers will happily declare a campaign successful. But advertising does not directly influence sales. The true and accurate way to measure the effectiveness of a campaign is in terms of the customer traffic it generates, and then the conversion rate of that customer traffic into sales. It’s possible, for example, that a marketing campaign will be highly successful in driving traffic to a store, but appear to have failed in terms of increased sales if the conversion rate is low. So again, the missing link is traffic data and conversion rates. Advertising is the main mechanism for driving retail traffic to stores, so retailers that pay to advertise but fail to measure traffic are making expensive strategic decisions without being able to evaluate them. The answer is for retailers to define an achievable traffic-response objective for every campaign. For example, the target may be to increase traffic by a stated percentage during a particular month or daily time period. Alternatively, you could benchmark the success of a promotional event by the number of visitors it attracts. Targeted traffic response campaigns such as this are best achieved by empowering store managers to apply their specific knowledge of store conditions. For most retailers staffing is the largest single expense. It’s also a cost that’s been rising steadily, at a faster rate than sales growth. During the last decade the UK national minimum wage has risen by an average of 4.6%*** per year, while retail sales have increased by only 3.7%****. Faced with this ever-rising tide, retailers can tend to take a negative, ‘damage limitation’ approach to managing labour, cutting back at every opportunity to keep costs from encroaching further on profit margins. But such cost cutting can be counter-productive in defending profit margins, since staffing is also the most critical factor in sales performance. To deploy staff effectively, retailers need to understand the relationship between staff levels and sales conversion. Deloitte’s analysis confirms that increasing staffing enables better customer service, which directly enhances sales conversion. The precise effect of staffing on sales conversion varies between different retail categories. 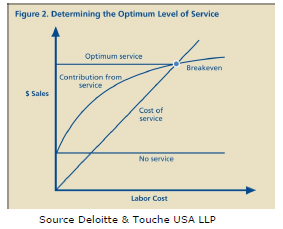 As shown in the figure, increasing the levels of service generally results in greater conversion, until a maximum rate of conversion is achieved or the cost of service exceeds what the additional sales will contribute to the profit margin. Higher levels of service then give rapidly diminishing returns on the labour cost. The challenge is to achieve the service level that optimises the net effect of sale contributions and the marginal cost of delivering them. Yet most retailers fail to apply any method or rigour in finding this critical balance. Instead they either guess at the right level of service or let the store determine it based on how many staff are left over after other tasks have been completed. Measuring customer traffic is the first practical step to finding both the ideal staffing level and the best way to deploy staff within a store. The principle is straightforward: to map staffing to traffic patterns. Counting systems allow managers to calculate the velocity (traffic per unit of time) in different parts of the building. Since every store is laid out differently this clearly requires an appropriately equipped counting system. Traffic data doesn't just reveal the ideal quantity of staff — it also provides a definitive way to measure, incentivise and reward staff performance. Sharing knowledge on traffic and sales conversion performance can motivate staff to take the initiative in attracting more visitors (for example with window displays) and converting more visits to sales by giving better customer service. Time for a culture shift? It’s clear from each of these three perspectives that by failing to count people traffic, UK retailers are neglecting a critical factor in their survival and success. The 80%+ majority of stores in the UK that do not currently count traffic remain in the dark about the number of sales opportunities they could’ve converted, the true impact of all they spend on marketing, and the effectiveness of their biggest cost: labour. As we’ve seen, this neglect stems largely from mistaken beliefs: that sales are the only variable worth counting, that customers who buy are the only ones worth knowing about, and that other aspects of customer behaviour and activity are just too difficult to measure, analyse and act upon. In the current climate UK retailers cannot afford to maintain such costly misconceptions. Once retailers recognise the value of people counting, it’s relatively easy to reap the benefits, thanks to advances in data-capture technology. The latest generation of counting systems includes video, Infra red beam and thermal based devices. Irisys, based in Northampton, UK has developed thermal counters that detect body heat and can count people passing in both directions separately. Thermal counters avoid potential privacy and security issues, as well as sunlight and shadow problems associated with video-based systems. The new IRC3000 range of counters from Irisys are IP based devices which achieve around 98% flow accuracy, and are easily added to your network to automatically bringing counts back to a central location. Sensors are now mostly mounted overhead at entrances and other key points within a store. They’re easier to install, and more accurate than side mounted units because they avoid occlusion (blocked field of view). Once collected, the data is easily handled using information management systems. Results can be analysed in a whole range of ways, and combined with other data such as sales or staff scheduling. This is facilitated through flexible reporting options, and powerful SQL database reporting, provided by companies like Axiomatic Technology. Counting systems can be in-store, intranet-based, or fully web-enabled remotely managed services. Live in-store systems give managers the power to make real- time analyses of conversation rates and the ability to respond when an issue arises. How to make it happen: empower the store manager We still like to call ourselves a nation of shopkeepers and, as we’ve seen, in many ways the battle for the future of UK retail is in the hands of those working on the shop floor. So perhaps the most practical way to harness the power of people counting is to put it in the hands of the shopkeepers: focused and incentivised store managers with day-to-day knowledge of their business and their team. People traffic intelligence empowers store staff with the necessary knowledge to optimise performance. This can make the critical difference in producing a thriving store — and ultimately, it can provide an ignition key for a reinvigorated retail sector. Tim Denby, Axiomatic Technology Ian Wilcock, Irisys (InfraRed Integrated Systems Ltd).